There is a new light-rail line being constructed in Southwest Portland. If you stroll down to the corner of 5th and Lincoln, you can stand in the open space next to this rather bland looking boxy brown brick building next to the Portland State Art Building. People of a certain age who visit this site will, no doubt, hear a piano playing faintly. Perhaps they will start humming "Satin Doll." This was the location of Sid Porter's restaurant, Sidney's. From the mid-1950s through the summer of 1966, Sid and his trio could be found here entertaining Portland's small band of live-jazz aficionados. In the later years Sid was joined by vocalist Nola Sugai, who would become Nola Porter. 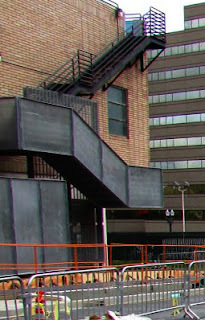 Fortunately, if you remember the place, and you hurry, you can still go to Google and see this street view of what was the old gray building. I'll leave the reminiscing about Sid, the Sid Porter Trio and Nola to a proper musical blogger. Surely, someone else will be inspired to revisit this era of Portland musical history. The building, however, has its own interesting story. Moe Gollock was born in Odessa, Russia (now a city in Ukraine) in 1898. After his father died, his mother Sarah with 5 small children, immigrated to the United States and headed for St. Paul, Minnesota, where her brother, Meyer Halperin, had a small cigar making business. By 1920, the family had moved to Portland. Moe worked at some clerical jobs before spotting an opportunity in the rapidly growing motorized transportation field. Soon he was driving fuel trucks between California and Oregon. Moe wanted to expand into Idaho but the 1935 Interstate Commerce Commission act had put the trucking industry under a lot of controls. Needless to say, the competing Union Pacific railroad thought it would be too dangerous for Moe to operate his trucks over the very curvy Columbia River highway between Portland and Huntington. Another trucking company that already operated in the area thought there was no need for a competitor. Both filed objections to Moe's expansion plans with the ICC. Someone cut a hole in the side of the tank of a gasoline truck belonging to the Mogul Transportation company, 9500 Northeast Sandy Boulevard, officials of that concern reported to Deputy Sheriff Wilson yesterday. The vandal apparently used an ax, the deputy said. Moe Gollock, operator of a fleet of oil trucks with headquarters at Northeast Ninety-fifth avenue and Sandy Boulevard, reported to Deputy Sheriff LaMonte yesterday an act of sabotage, apparently as the outgrowth of a labor dispute. He said that one of his trucks, which had started for Hood River, became stalled, and on investigation he found that a large quantity of sugar had been poured into the oil filler cup, putting the motor out of commission. Portland was a tough town in the 1930s. In 1938, Gollock sold his small fleet of tanker trucks and trailers to what would become The Greenbrier Companies. Moe retreated to operate an auto service business on Union Avenue. The years that Moe had spent on the road had introduced him to many restaurants, some good, many bad. In the back of his mind, Moe had long harbored the desire to open a restaurant that did everything just right. During the war years, he met and married Belle Sharp, an Oklahoma-born lady who grew up on a farm in the very southwest corner of Colorado. It was the second marriage for both of them. 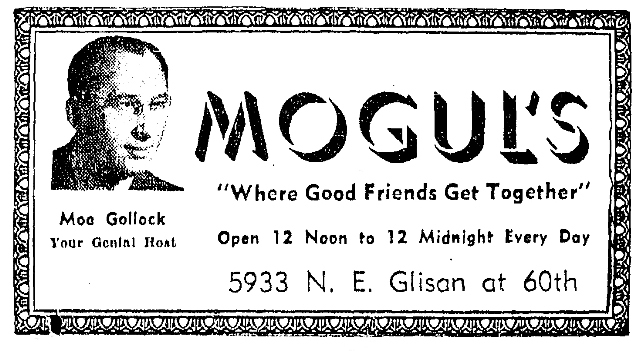 In August of 1944, Moe and Belle obtained their beer and wine license and opened Mogul's, "Where Good Friends Get Together," at 5933. N.E. Glisan. They had one employee. The restaurant thrived as Moe was, indeed, a genial host and Belle was a wizard in the kitchen. Serving what was then considered "exotic" fare, they built up a loyal following and in a few years they had outgrown their East side location and were looking for new quarters. Meanwhile, downtown at the corner of 5th and Lincoln, Victor's Restaurant had tried a couple of ideas. They advertised "Delicious English Style Fish and Chips" for 60 cents. Then they offered "Kosher Salami and Eggs" for 75 cents. Both were accompanied by deep apple pie, but apparently weren't what that corner needed. 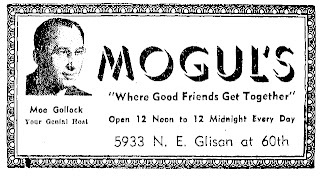 In 1949, the Gollocks redecorated the building at 5th and Lincoln and moved in, proudly renaming their place "Mogul's Le Gourmet." The American Weekly was a Hearst Publishing Sunday supplement magazine that had widespread circulation in 1950. Their June 25 issue featured Mogul's in The Epicure column. 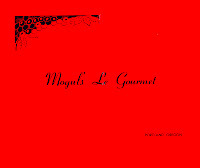 Mogul's Le Gourmet is one of the outstanding dining rooms of the Pacific Northwest. 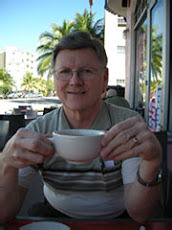 Mr. Gollock enjoys serving foods that are unobtainable in the ordinary restaurants or markets. 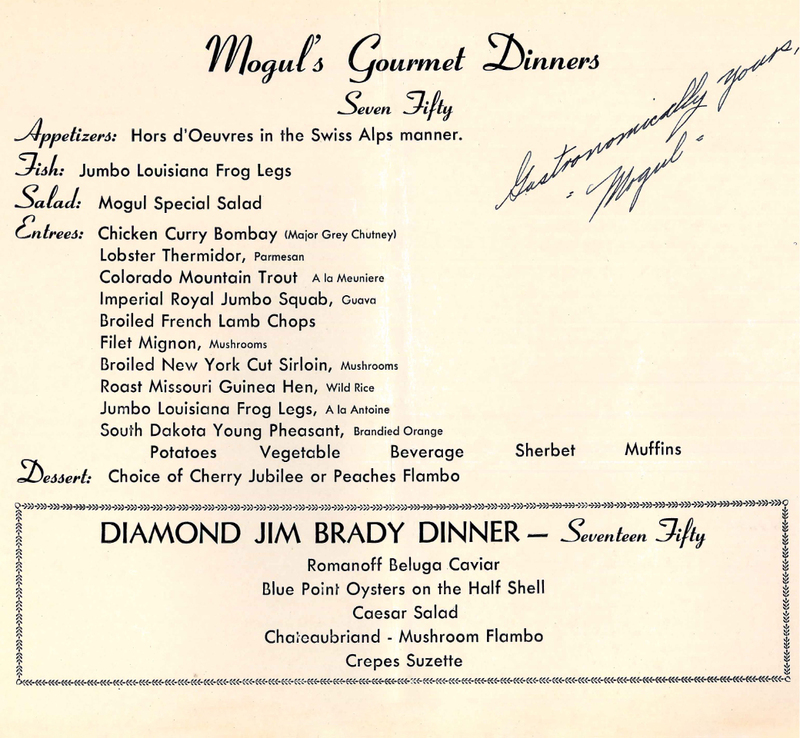 English partridge and quail, Missouri guinea hen, South Dakota pheasant and Colorado trout are an everyday event at Mogul's. The article goes on to share Belle's recipe for Chicken Curry-Bombay. That last quote undoubtedly refers to a 1954 visit to Portland by Miss Swanson who was, at that early date, advocating an organically-grown vegetarian diet for good health. 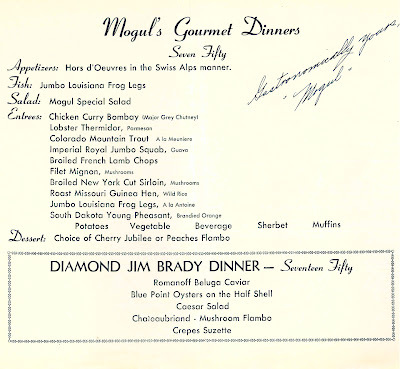 At its peak, Mogul's LeGourmet offered their entrees at either $5.00 or $7.50 ($44 and $66 in today's prices) depending on the accompaniments. Wouldn't it be interesting to look at the actual menu? Thanks to the Clementine Paddleford Papers, Department of Special Collections, Kansas State University, Manhattan, Kansas, we can! Kansas State University, Manhattan, Kansas. The Clover Club at S.W. Tenth and Taylor had remodeled and opened in late February of 1954. When the Clover ran an ad for the opening of "famed singing comedienne, Beatrice Kay" in person on March 24th, some readers were surely jolted by the note, "Dinners by Belle Gollock, formerly of Mogul's." Belle and Moe had separated. 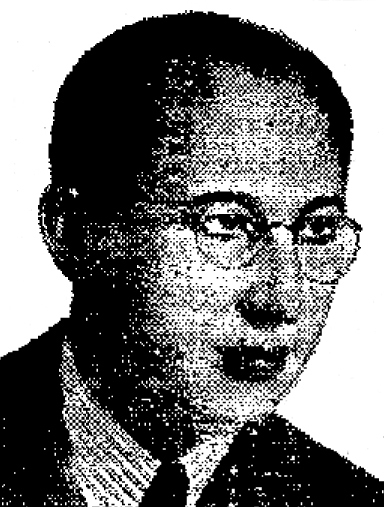 On November 27, 1954, The Oregonian announced that Morris Gollock, 55, had been found dead the previous day in his apartment. Adding insult to injury, the article manages to double-mangle Belle's name as, "Delle Mollock, Beaverton, from whom he has been estranged." For Mogul's, the End. For Sidney's, the Beginning. Belle's departure from Mogul's probably doomed Mogul's, which closed at the news of his death. But Moe, in his will, directed executors "to continue to operate Mogul's restaurant in a manner that will be a credit to Portland." The restaurant was quickly reopened. With neither Gollock present, Mogul's struggled for an identity. They offered a $2.95 tenderloin dinner, then a lower priced $1.75 Prime Rib. Both were accompanied by Mogul's Caesar Salad. Finally, on August 20th it was announced that Belle would be reopening Mogul's. An October ad asked, "Where else can you dine so well?" At the bottom, was the note, "Chef: Mrs. Mogul." ...Sidney's, a southwest restaurant and nightclub, features not only one of the hottest combos in town but the singing of bartender Wayne Keith and waitress Barbara Helzer. They are shown with Jobie Rucker at the bass, Sidney Porter at piano and Earl Garnett at drums. The trio played for Vice President Richard Nixon during his visit in Portland last week. The vice president was entertained at the Masonic Temple. So, if you do venture down to stand in the midst of that light-rail construction site and you can hear "Satin Doll" playing faintly, pay attention. You might just notice a trace of the fragrance of chicken curry in the air, too. Many thanks go to Portland resident, Aliza Earnshaw, who was kind enough to take time from her schedule to photograph this former restaurant site for me. Both Moe and Belle Gollock will live on for many years, if only in legal texts. Moe and Mogul Transportation can be found in several cases involving the ICC and other transportation lawsuits. Belle passed away in California in 1985. Her name is probably familiar to many lawyers and judges resulting from a legal case involving her son by her first marriage. You can Google the phrase, "Good to see you, Mrs. Gollock" to get that story. 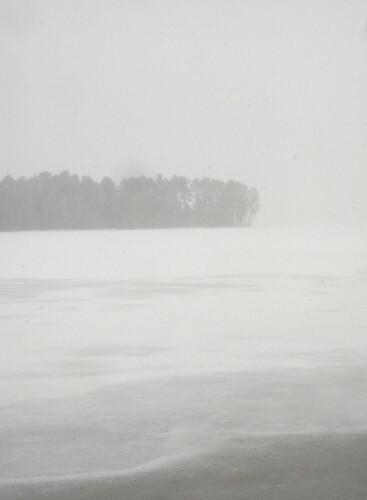 We returned home to Minnesota later than usual this year, arriving on April 3rd. 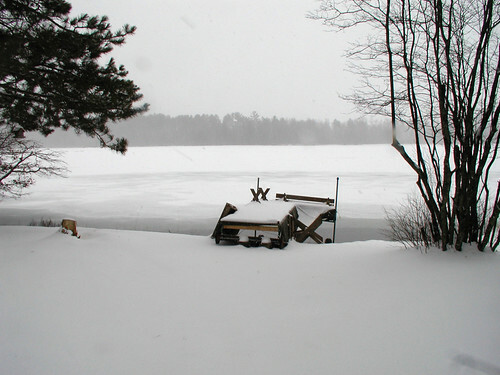 While we were in Cairo, I began thinking about getting started on our new vegetable garden at the lake. Buying fresh tomatoes, cucumbers and eggplants will get you thinking of that. 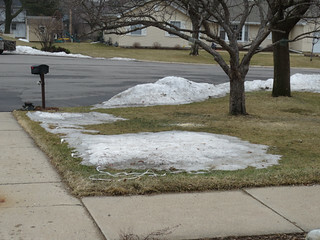 Last year, when we arrived home on March 19th, the temperature was 77 degrees and our front yard looked like this. 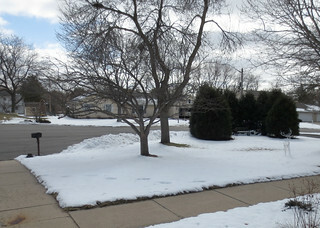 This year, the ground was still covered with snow on April 3. I didn't even take a picture until April 8. I probably could have chipped those Christmas decoration cords out of the ice on that day, but why not wait a few days and let the ice melt. 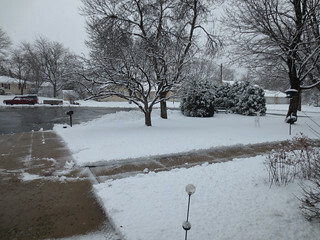 Here is the front yard on April 11 the day after I used the snowblower on the driveway. Compare with this morning, the 16th. We are making progress. Maybe things are better up at the lake? Last year I took these pictures on March 24th. 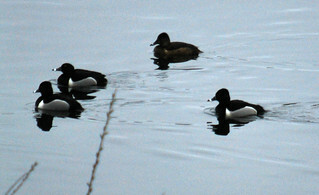 Those are ring-necked ducks passing through on their annual migration. 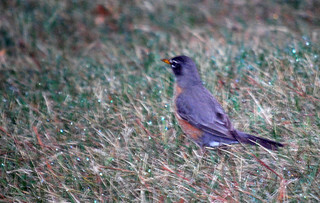 There were so many of them that even the robins turned to look. We haven't ventured up to Gordon yet to open the cabin. Fortunately, we have neighbors who keep us up to date on the weather. 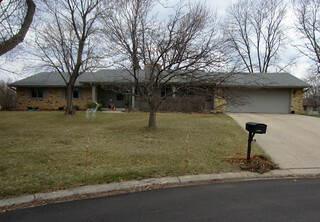 Neighbor Tom ventured out during a snow shower and took these pictures on April 12th. 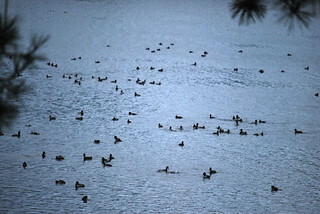 I guess the ducks won't be landing for a while. And we won't be putting the boats in the lake. And starting the garden can wait, too. I wonder why people in other parts of the country think there is year-round snow in Minnesota and Wisconsin. 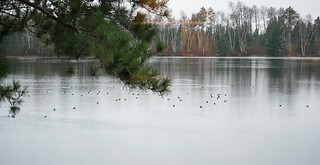 By the way, the Wisconsin fishing opener is just eighteen days from today. And the weather forecast up north for the next few days? Was it Safe in Egypt? It sure seemed safe. There was plenty of excitement in places that we didn't go near, like the presidential palace or the Muslim Brotherhood headquarters. But how could you not feel safe when you have a bawab and family who watches everyone's comings and goings? 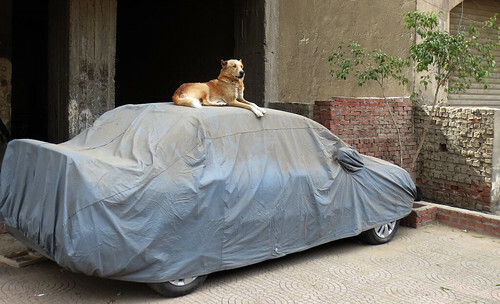 And our bawab even has a guard dog who keeps a sharp eye on things. And the front of our building now has a 24-hour tire dealer not to mention the 24-hour pharmacy a couple of doors away. Regular followers of this blog might like to read about Rick Steves' trip to Egypt. He has just arrived and is describing his experiences here. ... I begin with a nighttime welcome-to-Cairo stroll under once-elegant French façades, now weathered to a pulp and caked in soot. A four-lane street is now barely two lanes, choked with clothing racks swinging for sale under commercial neon. Women in scarves browse through displays of daring dresses in windows that light the commotion filling the sidewalk. This nation has a young, fast-growing population, and no cushy oil revenues to fall back on. Egypt needs to work for a living, and tourism is a vital part of its economy (four million people work in tourism and many more indirectly). However, since the revolution just over two years ago, there has been almost no tourism here. I mention to a local guide, "The airport was quiet today." He says, "That's not the word. It is dead." Pointing to a towering Sofitel Hotel, he laments, "Only two floors are open out of twenty. This is killing us." Our trash collector stops by our apartment just about every other day. He picks up whatever we have out in the plastic can in the hallway and then rings the doorbell to ask, "rrrubish?" For this service, we pay about seventy-five cents per month. (That's the official rate, we usually double it.) Our collector, probably in his late teens, is a very cheerful young man. We add fresh-baked cookies or excess fruit to his fee also. 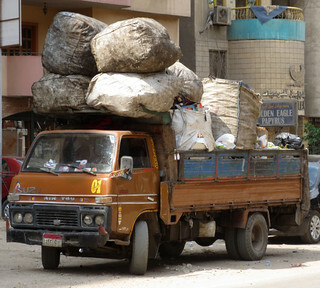 The Cairo trash collection system is often described as informal. It is handled by a part of the Christian community known as the Zabbaleen. 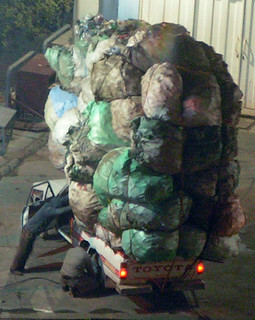 Trash collection by an ethnic minority is not unique to Egypt. When I was growing up in Portland in the 1950s, our garbage was picked up by Eddie Lofink, one of the many Volga Germans who ran the business there. 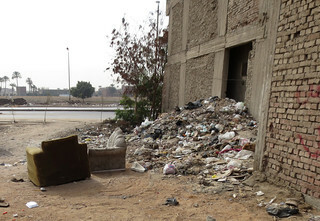 Many visitors to Cairo take away images of piles of rubbish lying in the streets, against a building, or sometimes only slightly visible, piled high behind a stone wall. 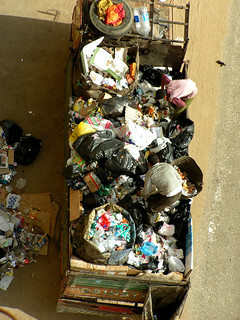 But the garbage haulers are also visible if you know what to look for. 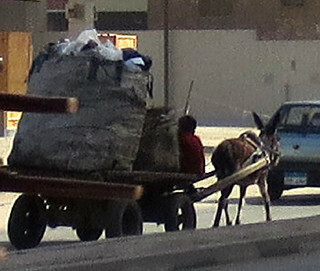 They might be on a donkey cart, on foot or in a truck. Actually, those piles of rubbish are just the beginning of a remarkable recycling process. The edible portion will be harvested first. Later, the haulers will perform a first sort on-board their trucks. 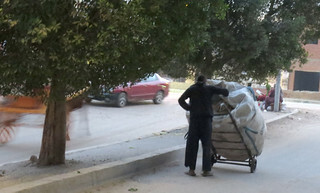 This Al-Jazeera video on YouTube describes the whole Zabbaleen sorting and recycling process. 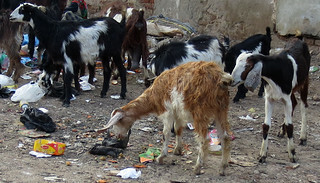 According to sources cited in the Wikipedia entry, "... the Zabbaleen recycle up to 80 percent of the waste that they collect, whereas most Western garbage collecting companies can only recycle 20 to 25 percent of the waste that they collect." Our bags are packed. A ride to the airport has been scheduled. 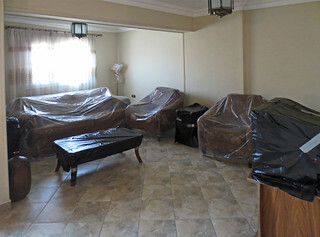 All the furniture pieces have dust covers. The luckiest cat in Cairo has no idea that his three month vacation from street scrounging is coming to an end as he naps by the door. So it's time to sit back and analyze Egypt's situation. Is there any hope? Not for the short term. One of the first posts on this blog after we arrived showed a long line of trucks waiting for diesel. Ten weeks later the lines are still there but you can read about armed clashes and killings between people waiting in the lines. The bakery owners are storming the government ministries downtown. And, for three months, I've been asking everyone, "who are these people in the tents in Tahrir Square?" No one knows, but everyone wonders. Yesterday, the Interior Ministry said that there was nothing they could do to clear them out, however. 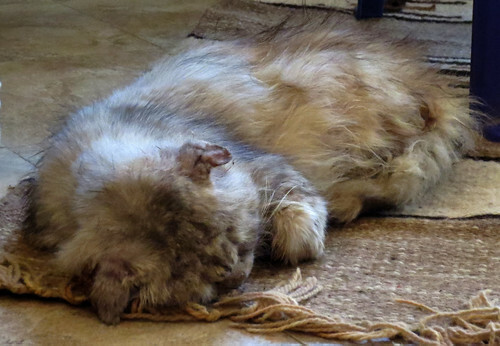 Maybe our little stray cat, nicknamed Misty, is really just a metaphor for the whole country. I hope he makes it through the year.